A lot has happened since our first Battle of the Boxes post. At the time, e-juice subscription services were pretty new, and there were only a handful of options available. Since then, some have monumentally fallen out of favor and others have swooped in to take their place, and the offerings from the services we covered have evolved and improved. The basic premise is simple: you sign up and pay each month, getting a selection of e-liquids to try out in return – usually based on your flavor preferences. With so many e-liquid companies vying for your custom, these services help you navigate the plethora of options and find your new all day vape. If you’re looking to sign up for an e-juice subscription service, however, the decision is getting progressively more difficult to make, so which is right for your needs? Here’s an updated run-down of the different e-juice subscription services. Vapebox is one of the oldest e-juice subscription companies on the market, based out of California and offering three different subscription levels, ranging from 45 ml to 75 ml of juice with or without two bits of hardware or accessories per month. Vapebox works in very much the same way as most subscription services: you tell them what juices you like (from baked goods, candy, cereal, tea, menthol, fruits, coffee, creams and custards), any specific flavors you don’t like (more specifically, e.g. blueberry or nuts), your nicotine level (from 0, 3, 6 or 12 mg/ml) and whether you prefer higher-VG juices, and then they ship out a box based on your preferences. Vapebox is different from most companies in that they also offer the option of hardware and/or accessories in your monthly box. This is also curated based on your preferences. First, you select your level of experience with vaping (“a little,” “some” or “very” experienced), then choose which type of atomizers you prefer (from RDAs, RTAs and tanks) and what type of mods you prefer (mechanical, regulated or hybrid). You’re then asked if you’re open to “trying new things” to see if you want an off-palate choice every now and again. Enthusiast (75 ml of juice + 1 to 2 pieces of hardware/accessories): $60 (shipping is $6). When you’ve signed up, your first box will be shipped by the end of the week, then your billing and shipping recurs on the same date each month. You can skip a month or cancel whenever you like, though! What Juices and Hardware Do I Get? Vapebox carries numerous brands of hardware and juice, including Aspire, Brother’s Reserve, Charlie’s Chalk Dust, Cloupor, Congrevape, Cosmic Fog, Council of Vapor, Flawless, Freemax, GeekVape, Horizon Tech, Joyetech, the Milkman, Nick’s Blissful Brews, One Hit Wonder, P.O.E.T., Pioneer4You, Sigelei, the Standard Vape, Uwell, Wotofo and tons more. 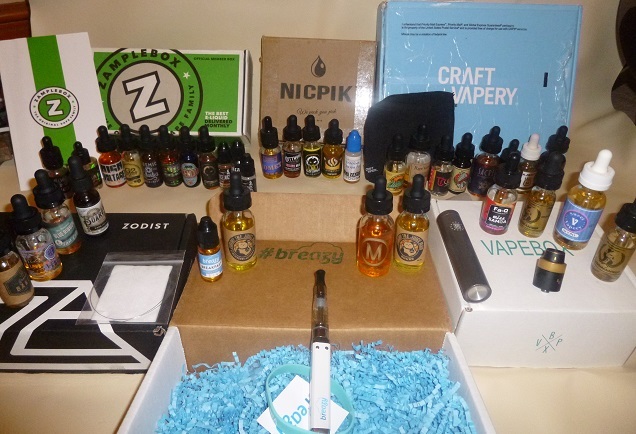 Since Vapebox first got started, feedback has been broadly positive, with better reviews for more recent boxes. Originally, clones were very common for the hardware, but this has changed a lot over the past year, and the juice selection process has also improved. It gets a lot of praise for the overall concept too. What Did I Think to Vapebox? I’ve received several Vapeboxes over the past year, always “Enthusiast” boxes, and I’ve seen the improvement first-hand. Originally, it was a great concept – picking up a mod or RDA and an accessory alongside a selection of juice) – but in practice it left a little to be desired. But things have changed a lot in 2016, and particularly in my August box. I received Batch 01 from Tinted Brew Liquid Co., Flex by Mighty Vapors, Milk and Honey by Cosmic Fog, Hoops by Alpha Vape, the Nobunaga Mini by Tendou Vapor and a GeekVape Tool Kit (for rebuilding). All of the juices were well-suited to my tastes – especially Batch 01, which was an all-day vape for me – and the hardware was a fantastic fit too. You can choose what types of mods and atomizers you receive, and this means you end up loving the hardware just as much as the juice. In particular, I was impressed with the Tool Kit as an accessory – it’s incredibly useful and the sort of thing you might not pick up in one convenient package otherwise. I enjoyed everything, and in my experience you always get at least one thing you really love in your monthly Vapebox. For the price, it’s an excellent deal, and Vapebox is the undisputed king if you’re looking for hardware alongside e-juice each month. Read the full Vapebox review here. Use the exclusive Vapebox coupon code “ECR10 ” (without quotation marks) when you sign up for 10% off your first box! Zamplebox is one of the original e-liquid subscription services, having gotten started in late 2013, and the Washington-based company is still going strong. The company now offers three different subscriptions – ranging from three to eleven bottles per month, offering from at least 30 ml up to at least 120 ml of e-liquid delivered to your door. Zamplebox is also easy to set up: you subscribe to the service, select your level of experience with vaping, choose the general types of e-liquid you want to receive (with options of dessert, fruit, menthol and tobacco), select flavors you want to avoid or that you especially like (with a free choice), choose your nicotine level (0, 3, 6, 12 or 18 mg/ml) and then choose your box. When you’ve signed up, you make the first month’s payment and the order starts processing immediately afterwards, taking 1 to 2 days to leave the warehouse and then another 3 to 5 business days for shipping. You’re billed on the same day each month afterwards, and your juices ship around the same time each month. They also offer international shipping. The three subscriptions available are called Silver, Gold and Platinum. The Silver package comes with three bottles a month (30 to 50 ml) and is priced at $19.99, the Gold package comes with six bottles a month (60 to 100 ml) for $24.99 and the Platinum package comes with 11 bottles (120 to 180 ml) for $44.99 per month. For domestic shipping, the cost ranges from $4.99 to $8.99, and for international (checked for the UK) from $9.99 to $14.99, both depending on the subscription chosen. You can cancel at any time, or you can also skip a month if you want a break. What Juices Do I Get? The complete list of juice companies Zamplebox uses is available, and these include Cosmic Fog, the Standard Vape, Jackson Vapor Co., Seduce Juice, Must Vape, Good Life Vapor, Boardwalk Vapor, NicQuid, Nick’s Blissful Brews, Ben Jonson’s Awesome Sauce and many others. Generally speaking, Zamplebox is pretty well received, with some caveats. With any service like this, vapers are bound to get one or two juices that they don’t particularly like, but many people do enjoy the majority of the juices. The Grumpy Vaper had a relatively typical experience, enjoying some of the flavors but being let down in the end by many of the others. Others are much less impressed, particularly because some report that differences in flavor profiles had little impact on the actual juices received. Our last post had some disappointed customers in the comments, too. Since our previous post, there has been a scandal (in the world of e-juice subscription services, at least) involving Zamplebox sending out juices made by another company from the same owner, called Clear Creek. They were effectively creating “in-house” juices under the other company’s name and shipping them out via ZampleBox – although Tony from Zamplebox takes issue with this allegation. Clear Creek is now non-existent, but the whole experience left a bad taste (both literally and figuratively) in the mouths of many vapers. What Did I Think to Zamplebox? I reviewed an 11-bottle box from Zamplebox, and overall I was pretty impressed with the juices I received. Like other reviewers, I found myself a little disappointed with some of the choices in the box – and I got the sense that the selection process wasn’t particularly well-personalized – but most of the juices were delicious, and the focus on cookie dough juices fit well with my general preferences. I did receive two juices from the same mixer, which I don’t really think is necessary with such a wide range of brands on offer, but overall I was pleased with the selection. Zamplebox is one of the cheapest subscription services on the market, and the whole process is definitely efficient, but the downside that comes with that is a lack of the personal touch you get with a lot of subscription services. It’s like dealing with a large multi-national company instead of a small-time family business: they’re good – which is how they got where they are – but you do feel less individually catered to as a result. Read the full review of Zamplebox here. Zodist got started in 2014, and has become a firm favorite with vapers, offering five different subscriptions for between 30 and 120 ml of e-juice per month. The company quickly became known for its unique packaging and their focus on customer service – offering to replace any juices you aren’t satisfied with, completely free of charge. Zodist claims to have the most accurate flavor-profiling system on the market, and it works through a simple four-question quiz which asks the general types of flavors you want to try, if there’s anything you want to avoid (with a disconcerting suggested answer of “onion”), if there’s anything you want to try in particular and which nicotine levels you’re happy with (0, 6 and 12 mg/ml are the only options). This is a fairly simplistic approach in comparison to ZampleBox and Vapebox, but with the open fields for anything you really dislike or really like, it makes up for using very few questions. After completing the quiz and setting up an account, you choose your subscription level. The lowest level offers 30 ml of juice (2 bottles) for $23.99 a month, the next is 45 ml of juice (3 bottles) for $29.99, then $39.99 for 60 ml (3 or 4 bottles), $59.99 for 90 ml (5 or 6 bottles) and the most juice available is 120 ml (6 to 8 bottles) for $79.99 a month, all of which come with free shipping. As you may have guessed, some of these will be 30 ml bottles and some will be 15 ml. International shipping is available where allowed by law. You’re billed at the same time each month, and the boxes will ship within a week of your billing date. Of course, you can cancel your subscription at any time. Zodist works with a lot of brands, including Space Jam, Cosmic Fog, Coval Vapes, Ripe Vapes, Time Bomb, Halcyon Vapors, Beard Vape Co., Classified E-Liquids, Jimmy the Juice Man and Adam Bomb, along with many others. Overall, the feedback on Zodist’s offerings has been thoroughly positive, about the flavor selections, the quality of the juice overall and the customer service received. Of course, not every flavor is perfect for the recipient, but overall there are very few complaints about the flavors received. The price isn’t the lowest, but vapers generally find it worth paying a little more for a quality service. What Did I Think to Zodist? I picked up a four-bottle box from Zodist, and overall, I was extremely impressed. I loved every single flavor, to the point where I struggle to choose a favorite. The selection of juices matched my preferences so closely you start to feel like they’re better than you are at choosing e-liquids you’ll love. Their seemingly over-hyped claim of being the best flavor curators on the market is actually true, based on all of the services I tried. The thing Zodist really nails – aside from a genuinely delicious selection of e-liquid all-round, excellent customer service and unrivalled curation – is the personal touch element to these services. Your flavors are individually picked for you by a real person – and someone extremely well-versed in the various e-liquids available, at that – and it really shines through. The price is one of the only downsides to the whole thing, but if you’re looking to find new juices you’ll love above all else – not just a cheaper, lower-effort supply of vape-able juice – Zodist is pretty damn hard to beat. Read the full review of Zodist here. Tri Nguyen of Zodist (in the comments section below) has kindly offered a coupon code for 15 % off your first Zodist box for anybody researching the best service. Just enter “THEZODISTEXPERIENCE” (without quotations) at checkout. The Drip Club is a California-based e-juice sampling company that got its start in late 2013, and now offers something a little different from the rest of the options on this list. They used to offer subscriptions, but stopped in favor of the new Hero Box, which works in roughly the same way but without the pressure of recurring payments. The Hero Box offers 60 ml of e-liquid for $24.95, and the selection is changed each week – and put up on their site so you can see what you’re getting before you buy. You can be notified when the new box becomes available, so, if you’re willing to keep checking back and placing separate orders, you can use it like a subscription service except remove the element of uncertainty. The box will ship within 2 business days of you placing the order, and domestic shipping costs $3.75. They also offer curated sample packs, which are four-packs of juices from various mixers for $29.95 – again, you can see what you’re getting before you buy – and you can also get a mystery pack, featuring at least 130 ml of juice for $44.95. International shipping is available to selected countries. The Drip Club offers juices from a wide range of manufacturers, including Cuttwood, the Schwartz, the Real, Steam Factory, Kilo and many more. The good thing is that you can check out which juices you’re ordering before you buy. Now that the Drip Club works more like a sampling service than a subscription service, you can pretty much treat it like any other e-liquid purchase: check out reviews of the mixer and try to choose flavors that appeal to you. The subscription service did get pretty good feedback, and they carry some big-name juices, so if you choose carefully you’re unlikely to be disappointed. Craft Vapery is a California-based e-juice subscription service, which has since expanded into an online vape store. The subscription service has six different pricing schemes, offering between (at least) 30 and 120 ml of e-liquid per month. The service works much like the others, with a simple set of questions to determine which flavors you like and dislike – with a wide selection of options and the ability to write in extra detail – for example, “I like tree fruits but not pear” – your preferred nicotine level (choices of 0, 3, 6, 12 and 18 mg/ml) and whether you prefer higher-VG e-liquids. Then you simply choose your subscription and you’re ready to go. The six subscription options are: $19.99 for two 15 ml bottles, $28.99 for three, $36.99 for four, $43.99 for five, $49.99 for six and $61.99 for eight, all of which are the minimum number of bottles you’ll receive. You can also add on some atomizer heads each month, if you like, or a one-off order of a starter kit. Shipping costs aren’t mentioned until you’ve gone right through the process – not even being stated before you have to enter your payment details –but are $4.99 for most boxes (although this was only $4.58 for the two-bottle subscription). They also ship internationally wherever allowed by law. Your e-liquids will be shipped within one business day of you signing up for the service, and the billing date stays the same each month unless you specifically change it to another date. The packages after the first will ship within a month of you being charged, and you can cancel your subscription at any time. Craft Vapery works with a wide range of brands, including Beard Vape Co., Adam Bomb, Black Label, CRFT, Classified, Cuttwood, Five Pawns, Halcyon Vapors, Jackson Vapor Co., Jazzy Boba, Mr. Good Vape, POET, Propaganda, Rehab, the Standard Vape, Velvet Cloud and many more. Craft Vapery receives overwhelmingly positive reviews, with vapers generally being very happy with the juices chosen for them, and their dedication to customer service. The service isn’t quite as cheap as ZampleBox, Vapebox or NicPik, but is widely considered to be worth it for the quality. What Did I Think to Craft Vapery? I received an eight-bottle box from Craft Vapery in my first month and a five-bottle box in my second month (with two more five-bottle boxes to come, at the time of writing), and I was very impressed with both. Out of the 13 bottles, there was only one I didn’t enjoy too much, and even that one sounded like it’d be my sort of thing: I’d have probably made the same decision myself if I was buying the juice. The overall impression I got was that this is another well-personalized service that really takes your preferences into account before shipping out juices. For example, I mentioned I like cinnamon roll juices in the free-entry portions of the signup process, and they sent one in my first box. That’s the sort of service and personalization you get with Craft Vapery. The boxes are also well-presented, and come with plenty of extras – like small bits of wicking material, Craft Vapery-branded cloth to wipe up any juice spills, needle-topped bottles and Skittles (which I enjoy receiving way more than I should) – that make the entire experience very positive. In short, I love Craft Vapery: it’s a great service provided for a very reasonable price. Read the full Craft Vapery review here. Use the exclusive Craft Vapery coupon code “CRAFTECR” (without quotation marks) to get 10% off anything from the Craft Store and 20 % of the first month of your subscription on sign-up. JuiceCrate is another California-based subscription service, with three options for subscription ranging from 45 to 120 ml of juice per month, along with some resistance wire and cotton thrown in for good measure. JuiceCrate is simple: you choose your subscription, select your nicotine level (either 0, 3, 6 or 12 mg/ml) and then answer a series of questions about the types of juices you’d try, such as candy, tobacco, dessert, earthy, fruity, spiced and creamy, with a “yes,” “no” or “surprise me.” After that, you select your preference for wire gauge and you’re pretty much ready to go. The three subscription options are relatively similar. For the Silver plan, you pay $35 per month and receive three 15 ml bottles of juice and one pack of nichrome wire, for the Ruby plan you pay $49 per month and receive four 15 ml bottles of juice and one pack of wire, and for the Obsidian plan you pay $99 per month and receive four 15 ml bottles and two 30 ml bottles of juice, as well as two packs of wire and some surprise vaping accessories. All of these plans come with free shipping. When you’ve placed your order, it will be processed immediately, with two to three business days for curating and then two to five days for delivery. They also offer international shipping to any country where it’s legal to ship e-liquid. JuiceCrate has several partners, but not quite as many big names as some other services. The brands you might find in your subscription include Boardwalk Vapor, Time Bomb, The Standard Vape, Jackson Vapor Co., Vaping Birdy, High Voltage, 99 Thrones and Atomic Vapor. The response to JuiceCrate has been fairly positive, with most vapers very satisfied with the quality of juices, the flavor selections they receive and the packaging the juices come in. They also received positive comments about their customer service, and although the price isn’t the cheapest, it’s still a great deal in comparison to buying juices directly from the mixers. Nicpik is a Florida-based e-juice subscription service that got started in March 2014, with two options for subscriptions available: one offering three 15 ml bottles (45 ml total) and another offering five bottles for a total of 60 ml or more of e-liquid. The system for Nicpik is simpler than most subscription services: you choose the number of bottles you want each month, then have the option of either the Variety Pak (everything except tobacco and menthol), the Fruit Pak, the Dessert Pak or the Ultra Pak (everything), and then choose your nicotine level (0, 3, 6, 12 or 18 mg/ml). After you’ve been through the process and chosen how frequently you want to make payments (with options of each month, every three months, every six months or once a year), you’re given the opportunity to tell them which flavors you normally like and which ones you normally dislike, allowing them to tailor the included liquids to your preferences. The two main plans available are the standard option (with five bottles and at least 60 ml of e-juice per month), which is $23 per month if you pay for a year up-front, $24 per month if you pay every six months $25 per month if you pay every three months and $29 per month if you pay monthly, and the Nicpik Mini pack, which offers three 15 ml bottles of juice for $18 per month if you pay annually, $19 per month if you pay every six months, $20 per month if you pay every three months and $22 per month if you pay monthly. Your payment is taken on the same date as your original sign-up, and that’s also when the bottles will be shipped. International shipping is available, for $9.99 to Canada and $14.99 to most other countries. You can cancel at any time. Nicpik has a smaller selection of brands than many other services, but there are still quite a few options available. Many brands available through many of these services – such as Boardwalk Vapor, Cosmic Fog and Cuttwood – but you can also pick up other options such as Hurricane Vapor, Charlie Noble, Boosted, Mojo Vapor, DB Liquids and Cyber Liquids. The feedback from vapers about Nicpik has been positive, but some reviews have been a little mixed: most e-liquids are enjoyable, but as is common with these subscription services it’s easy to get a few juices that aren’t quite to you taste. Nicpik’s questions about flavor preference aren’t particularly detailed, so their selection process may suffer a little bit as a result. What Did I Think to NicPik? I got a five-bottle box from NicPik, and overall I was happy with the selection. I received mainly fruity juices, with one dessert blend and one cereal option. Two of the fruity juices had elements of cream, and that definitely suited my tastes well, but the other felt a tad too generic and not tailored to me. The issue with the lack of detail – aside from an open, “type what you want” style field for both likes and dislikes – does seem to come through in the chosen flavors, but they do still do a good job overall. I’d rank them on par with Zamplebox when it comes to flavor selection. Generally, NicPik has pretty good prices and is a very straightforward service, and although some extra touches would be nice – improved presentation and that “personal touch” you get with some subscription companies – it’s a solid option overall. I wouldn’t put it as the best on the market, but it’s a good service nonetheless. Read the full NicPik review here. Breazy is an online vape store turned subscription service, having just gotten started with the subscription side to their business earlier this year and being based out of New York. They have two different subscriptions on offer, for either 60 or 120 ml of juice per month. Breazy works in much the same way as the majority of other services. First, you choose which level of subscription you want, then choose the general types of flavor you want to receive and your desired nicotine level before giving your details to complete the sign-up process. The flavor selection process is pretty simple, but still gives you some opportunity to get your preferences across. You select flavor categories out of ten options (tobacco, menthol, fruit, candy, dessert, donuts, cereal, custard, yogurt and chocolate) as well as bestsellers and surprise, checking the appropriate tick-box to identify flavors you’d want to receive. On the next page, you have the choice of between 0, 3, 6, 12 and 18 mg/ml of nicotine. You have a choice between the “Light” box, which contains 60 ml of e-liquid across between two and four bottles for $34.99, and the “Deluxe” box, which doubles the amount of e-liquid and the amount of bottles (for 120 ml and between four and eight bottles) for $64.99. Your first order also includes a Breazy vape pen (which is an iTaste EP), which is a nice extra and can serve well as a backup device. You also get free shipping on orders to the US, and international shipping is available. You can cancel at any time. Breazy started as a vape store, so they carry a wide range of brands, including Suicide Bunny, Space Jam, Jimmy the Juice Man, Charlie’s Chalk Dust, Cold Fusion, CRFT, Milkman E-Liquid, Nick’s Blissful Brews, Sicboy, Uncle Junk’s, THRST and many others. The range is really quite impressive (there are many more well-known names among the line-up), so there’s the potential to get some really excellent juices. Feedback on Breazy from vapers so far has been generally positive, with vapers being broadly happy with the flavors received, the pricing and the customer service from Breazy themselves. There were some minor complaints – one reviewer on Reddit, for example, hoped for a larger selection of juices rather than bigger bottles – but overall the experience has been a positive one for vapers who’ve reviewed the service. What Did I Think to Breazy? I received a four-bottle Breazy box, and despite some issues, I was happy overall with what I got. One of the flavors wasn’t particularly nice – although it admittedly sounded good on paper – and this was also an own-brand Breazy e-juice, which I would have been pretty unimpressed with even if it had been nice. You don’t subscribe to a service like this to get the company’s in-house juices (as Zamplebox learned). Similarly, I received two juices from the same mixer, which were both amazing, but ultimately you sign up to services like this to try some new mixers out, not just to get nice juices. It could just be “bad luck” in the terms of the box I got, but with so many excellent brands carried by Breazy, I would have expected four juices from different mixers. Both flavors were in line with my preferences, which is a good thing, but that’s not really the point. However, those are my only complaints with Breazy. Even with those things considered, I was happy with the box and the juices I received. They aren’t the best subscription service on the market, but they did send over some fantastic juices that I thoroughly enjoyed, so it’s unlikely you’d be disappointed if you signed up. Read the full Breazy review here. VaporLiq is based out of Los Angeles, and got their start in late 2013, offering a single subscription, providing 45 ml of e-liquid for $29.95 per month. VaporLiq has a straightforward registration process, but it’s impressively thorough: as well as selecting the type of device you use, your nicotine level (0, 3, 6, 12 or 18 mg/ml), and ranking your preference for desserts, fruits, drinks, tobaccos and candy (on a five-point scale and an option to not send that type of flavor), you go through and select individual options you enjoy in each category. You also give them feedback on what you receive to help refine the choices made for you each month. It’s easily the most detailed process out of all the companies covered here. The plan is simple, though, you get three 15 ml bottles for $29.95 per month, with free shipping, which ordinarily takes a few days. However, they don’t offer international shipping. Your payment is taken each month on the same date you originally took out the subscription. The brands available include Halcyon Vapors, Must Vape, Gonzo Vapors, 4 Seasons Elixir, Craft Vapes, Illuminati Vapor, Stratus and others. There aren’t as many big-name brands as for other subscription services, but there are still plenty of juices to try out. There haven’t been many reviews of Vapor Liq, but our own John Madden tried it out, and it’s been covered on RPad TV. Both reviewers were very impressed with the process and the flavor selection: it seems like the level of detail pays off. So how much will each subscription service cost you? We’ve worked out the costs based on domestic shipping (to California), but without any added taxes. Although you can save a bit more money by paying for several months at a time, this seems unrealistic for somebody interested in trying out a subscription service, so all the calculated prices are for monthly payments. Additionally, we used the best-value subscription, but went with the minimum amount of juice received each month, rather than the maximum you could receive. For Vapebox, we opted for the best-value liquid only subscription, rather than bringing hardware into the price comparison, although for Juice Crate there is no option but to include the resistance wire in the package. The table below gives all of the key facts about the different services, along with the subscription-only cost per ml and the total (excluding tax) cost per ml on the bottom two rows. View a larger version of the table here. So which e-juice subscription service should you subscribe to? Ultimately, this is a question only you can answer, and I’ve only tried six of the services here, but based on my experience, I can make some recommendations. I say this is a question only you can answer because it depends what you’re looking for. For example, if you want hardware as well as juices, Vapebox is pretty much the only game in town, and they're really an excellent option all-round. If you want to get a sneak-peek of what you’ll be shipped before you commit to a purchase, Drip Club’s Hero Boxes are the best approach. But if you’re looking for the “standard” subscription service – a selection of juices chosen with your preferences in mind, but kept secret until it arrives at your door – my experience leads me to mainly recommend Zodist, Vapebox, Craft Vapery and Zamplebox. The reasons for these recommendations are a little different. Zodist is, based on the boxes I tried, the best company for personally looking at your preferences and sending you juices that are in line with the sort of thing you like. More than any other service, it’s very clear that you get somebody with a wide range of experience with e-liquid flavors personally putting together a box for you, and doing their very best to get you juices that you love. And the result is fantastic. The big downside to Zodist is that it’s among the more expensive choices, at 67 cents per ml. In contrast, Zamplebox is just 45 cents per ml (these prices include shipping). The downside to Zamplebox is the lack of the personal touch and quite a few so-so juice selections in the box, but if you’re looking for a solid service that doesn’t cost too much, it does get the job done. You’ll love some of the juices, but you’ll admittedly probably get some you don’t enjoy too. For Vapebox, the liquid choices were about as good as Zamplebox (actually a bit better based on the last two boxes I received), but you can add some great hardware too, making them a very appealing option if you want more than just juice each month. They're also an affordable service (the Juice Lovers box is only four cents per ml more expensive than Zamplebox, for an e-juice-only subscription), so Vapebox has much of the same appeal as Zamplebox from a cost perspective. Craft Vapery sits somewhere between the two extremes. The service is well-personalized, and the juice selections are fantastic overall – I received just one juice out of 13 that I wasn’t too impressed with, but no company can hit the nail on the head all the time. Needless to say, the vast majority of the juices I received were great, and right in line with my preferences. For price, at 56 cents per ml, they’re exactly half way between Zodist and Zamplebox, but the quality is way closer to the Zodist end of the spectrum. The experience with Craft was excellent, all-round. These might not be firm recommendations, but it should be enough to guide you in the right direction. You should still check out the full list of brands offered by the different companies, consider what you’re looking for from a subscription service and read reviews from other vapers before making your decision, though. Overall (while the companies I didn’t try could be way better) looking at the feedback from other vapers and based on my own experience, I’d say – unless saving money is a big priority for you – Zodist, Vapebox and Craft Vapery should be the main services you consider.